Ground chicken is simply chicken that has been ground or finely chopped. 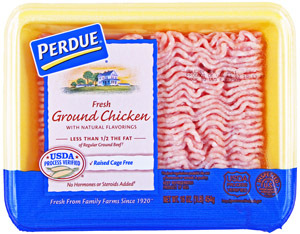 Ground chicken can be prepared at home or it can be bought from supermarkets, grocery stores or butcher shops. Ground chicken is minced or cubed chicken meat preferably from the less tender and less popular cuts of the chicken. Ground chicken or minced chicken is made of finely chopped chicken, minced by a meat grinder. One recipe example using Ground Chicken is Buffalo Chicken Chili. 1. Heat olive oil and butter in a large pot over medium-high heat. Place chicken in the pot. Cook and stir 7 to 10 minutes, until chicken is no longer pink. Stir in the carrot, onion, celery, garlic, chili powder, cumin, paprika, and salt and pepper, and cook and stir until the onion is translucent and the vegetables are beginning to soften, 3 to 4 more minutes. 2. Stir in the hot sauce, tomato sauce, crushed tomatoes, and white and red kidney beans. Bring to a boil, and simmer over medium-low heat about 1 hour, until the vegetables are tender and the flavors have blended. Which came first the Chicken or the Egg? Going with the Egg today! Eggs are laid by female animals of many different species, including birds, reptiles, amphibians, and fish, and have been eaten by humans for thousands of years. Bird and reptile eggs consist of a protective eggshell, albumen (egg white), and vitellus (egg yolk), contained within various thin membranes. Popular choices for egg consumption are chicken, duck, quail, roe, and caviar, but the egg most often consumed by humans is the chicken egg. Egg yolks and whole eggs store significant amounts of protein and choline, and are widely used in cookery. Due to their protein content, the United States Department of Agriculture categorizes eggs as Meats within the Food Guide Pyramid. Despite the nutritional value of eggs, there are some potential health issues arising from egg quality, storage, and individual allergies. Chickens and other egg-laying creatures are widely kept throughout the world, and mass production of chicken eggs is a global industry. In 2009, an estimated 62.1 million metric tons of eggs were produced worldwide from a total laying flock of approximately 6.4 billion hens. There are issues of regional variation in demand and expectation, as well as current debates concerning methods of mass production. The European Union recently banned battery husbandry of chickens. Chicken eggs are widely used in many types of dishes, both sweet and savory, including many baked goods. Some of the most common preparation methods include scrambled, fried, hard-boiled, soft-boiled, omelettes and pickled. They can also be eaten raw, though this is not recommended for people who may be especially susceptible to salmonellosis, such as the elderly, the infirm, or pregnant women. In addition, the protein in raw eggs is only 51% bioavailable, whereas that of a cooked egg is nearer 91% bioavailable, meaning the protein of cooked eggs is nearly twice as absorbable as the protein from raw eggs. Eggs contain multiple proteins which gel at different temperatures within the yolk and the white, and the temperature determines the gelling time. 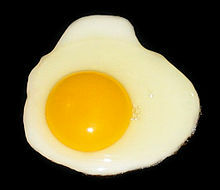 Egg yolk begins to gelify, or solidify, when it reaches temperatures between about 63 and 70 °C (145 and 158 °F). Egg white gels at slightly higher temperatures, about 60 to 80 °C (140 to 176 °F)- the white contains ovalbumin that sets at the highest temperature. However, in practice, in many cooking processes the white gels first because it is exposed to higher temperatures for longer. Salmonella is killed instantly at 71 °C (160 °F), but is also killed from 54.5 °C (130.1 °F) if held there for sufficiently long time periods. To avoid the issue of salmonella, eggs can be pasteurised in-shell at 57 °C (135 °F) for an hour and 15 minutes. Although the white is slightly milkier, the eggs can be used in normal ways. Whipping for meringue takes significantly longer, but the final volume is virtually the same. If a boiled egg is overcooked, a greenish ring sometimes appears around egg yolk due to the iron and sulfur compounds in the egg. It can also occur with an abundance of iron in the cooking water. The green ring does not affect the egg’s taste; overcooking, however, harms the quality of the protein. Chilling the egg for a few minutes in cold water until it is completely cooled may prevent the greenish ring from forming on the surface of the yolk. The US Department of Agriculture grades eggs by the interior quality of the egg (see Haugh unit) and the appearance and condition of the egg shell. Eggs of any quality grade may differ in weight (size). Eggs have whites that are thick and firm; yolks that are high, round, and practically free from defects; and clean, unbroken shells. Eggs have characteristics of Grade AA eggs except the whites are “reasonably” firm. This quality is seldom found in retail stores because they are usually used to make liquid, frozen, and dried egg products, as well as other egg-containing products. In Australia and the European Union, eggs are graded by the hen farming method, free range, battery caged, etc. Chicken eggs are also graded by size for the purpose of sales. Raw chicken may contain salmonella. The safe minimum cooking temperature recommended by the U.S. Department of Health & Human Services is 165 °F (74 °C) to prevent foodborne illness because of bacteria and parasites. However in Japan raw chicken is sometimes consumed in a dish called torisashi , which is sliced raw chicken served in sashimi style. Another preparation is toriwasa which is lightly seared on the outsides while the inside remains raw. Chicken can be cooked in many ways. It can be made into sausages, skewered, put in salads, grilled, breaded and deep-fried, or used in various curries. There is significant variation in cooking methods amongst cultures. Historically common methods include roasting, baking, broasting, and frying. Western cuisine frequently has chicken prepared by deep-frying for fast foods such as fried chicken, chicken nuggets, chicken lollipops or buffalo wings. They are also often grilled for salads or tacos. Chickens often come with labels such as “roaster”, which suggest a method of cooking based on the type of chicken. While these labels are only suggestions, ones labeled for stew often do not do well when cooked with other methods. Some chicken breast cuts and processed chicken breast products include the moniker “with Rib Meat.” This is a misnomer, as it is the small piece of white meat that overlays the scapula, and is removed with the breast meat. The breast is cut from the chicken and sold as a solid cut, while the leftover breast and true rib meat is stripped from the bone through mechanical separation for use in chicken franks, for example. Breast meat is often sliced thinly and marketed as chicken slices, an easy filling for sandwiches. Often, the tenderloin (pectoralis minor) is marketed separately from the breast (pectoralis major). 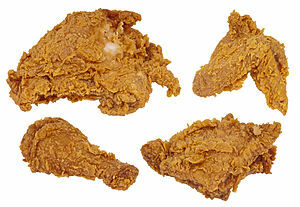 In the US, “tenders” can be either tenderloins or strips cut from the breast. In the UK the strips of pectoralis minor are called “Chicken mini-fillets”. In Asian countries it is possible to buy bones alone as they are very popular for making chicken soups, which are said to be healthy. In Australia the rib cages and backs of chickens after the other cuts have been removed are frequently sold cheaply in supermarket delicatessen sections as either “chicken frames” or “chicken carcasses” and are purchased for soup or stock purposes. 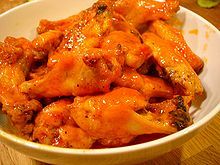 A Buffalo wing, Buffalo chicken wing, hot wing, or wing, in the cuisine of the United States, is a chicken wing section (wingette or drumette) that is generally deep-fried, unbreaded, and coated in vinegar-based cayenne pepper hot sauce and butter in the chicken. They are traditionally served hot, along with celery sticks and/or carrot sticks with blue cheese dressing for dipping. Cayenne pepper hot sauce and melted butter or margarine are the basis of the sauce, which may be mild, medium, or hot. Typically, the wings are deep-fried in oil (although they are sometimes grilled or baked) until they are well browned. They are then drained, mixed with sauce, and shaken to coat the wings. There are several different claims about how Buffalo wings were created. * Upon the unannounced, late-night arrival of their son, Dominic, with several of his friends from college, Teressa needed a fast and easy snack to present to her hungry guests. It was then that she came up with the idea of deep-frying chicken wings (normally thrown away or reserved for stock) and tossing them in cayenne hot sauce. * Dominic Bellissimo (Frank and Teressa’s son) told The New Yorker reporter Calvin Trillin in 1980: “It was Friday night in the bar and since people were buying a lot of drinks he wanted to do something nice for them at midnight when the mostly Catholic patrons would be able to eat meat again.” He stated that it was his mother, Teressa, who came up with the idea of chicken wings. * There was mis-delivery of wings instead of backs and necks for making the bar’s spaghetti sauce. Faced with this unexpected resource, Frank Bellissimo says that he asked Teressa to do something with them. Another claim is that a man named John Young served chicken wings in a special “mambo sauce” at his Buffalo restaurant in the mid-1960s. His wings were breaded. Young had registered the name of his restaurant, John Young’s Wings ‘n Things, at the county courthouse before leaving Buffalo in 1970. Marketing materials for Frank’s RedHot claim that it was the hot sauce used in the Bellissimos’ original recipe. The city of Buffalo officially declared July 29, 1977, to be Chicken Wing Day. Buffalo wings have become a popular bar food and appetizer across the United States and Canada. Large franchises specializing in Buffalo wings have emerged, notably Buffalo Wild Wings founded in 1982. As the market got larger, restaurants began to use a variety of sauces in addition to buffalo sauce. These sauces generally take influences from Chinese, Japanese, Caribbean, and Indian cuisines. Because of the mess caused by eating Buffalo wings, it is now common for restaurants to offer boneless wings that can be eaten with a fork. These are essentially chicken nuggets coated or spun in sauce. Many American-style restaurants in other countries will offer Buffalo chicken wings on their menus, especially if they also function as a bar. Buffalo wings are used in competitive eating events, such as Philadelphia’s Wing Bowl and at the National Buffalo Wing Festival. It has also become commonplace for restaurants to offer a contest featuring a customer eating a certain number of wings, coated in their hottest sauce. Many bars and restaurants intentionally create an extra-hot sauce for this purpose, and customers are usually rewarded with a picture on the wall or free meal. The appellation “Buffalo” is also now commonly applied to foods other than wings, including chicken fingers, chicken fries, chicken nuggets, popcorn chicken, shrimp, and pizza that are seasoned with the Buffalo-style sauce or variations of it. 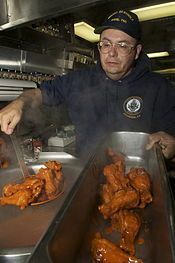 The flavor of Buffalo wings is replicated by a number of dishes. A common variation on the “buffalo” sauce flavor is found in potato chips produced by a number of different companies. Many of these “Buffalo Chips” also incorporate a blue cheese flavoring to simulate the complete Buffalo wing experience. Today, there are many flavors of prepared wings (wingettes and drumettes) available, besides the original hot Buffalo style. Flavors include barbecue, lemon pepper, pepper Parmesan, garlic, sweet-and-sour, and honey mustard. Since the first introduction, restaurants have introduced hundreds of different flavors of chicken wings. Chicken fingers, also known as chicken tenders, chicken goujons, chicken strips or chicken fillets, are chicken meat prepared from the pectoralis minor muscles of the animal. These strips of white meat are located on either side of the breastbone, under the breast meat (pectoralis major). Chicken fingers are prepared by dipping chicken meat in a breading mixture and then deep-frying them, in a manner similar to the preparation of Schnitzel. In the Northeastern United States, chicken fingers served in Chinese restaurants are often made with an egg batter and have a smooth texture. They are commonly served either as an appetizer or as a main dish. 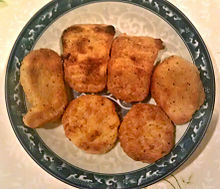 In other recipes, the breading mixture for chicken fingers can lack eggs and the texture of the dish itself can often be rather coarse. This version is often served alongside various dipping sauces. The dipping sauces can include: ketchup, blue cheese dressing, ranch dressing, barbecue sauce, honey mustard, Buffalo wing sauce, butter and garlic, plum sauce, curry mayonnaise, or sweet and sour sauce. Chicken fingers of this kind are often served in a basket with French fries, served on a garden salad, or in a sandwich, such as a wrap or on a bun. Chicken fingers are offered by various fast food chains such as Chick-fil-A, Zaxby’s, Raising Cane’s, Guthrie’s, Dairy Queen, KFC, Spatola Restaurant, McDonald’s “Chicken Select Strips” and Church’s Chicken “Tender Strips”. They are also a common offering on children’s menus in American restaurants. A chicken nugget is a chicken product made from either meat slurry or chicken breasts cut to shape, breaded or battered, then deep-fried or baked. Fast food restaurants typically fry their nuggets in vegetable oil, such as coconut oil. The chicken nugget was invented in the 1950s by Robert C. Baker, a food science professor at Cornell University, and published as unpatented academic work. Dr. Baker’s innovations made it possible to form chicken nuggets in any shape. McDonald’s recipe for Chicken McNuggets was created on commission from McDonald’s by Tyson Foods in 1979 and the product was sold beginning in 1980. Some fast food restaurants have launched vegetarian alternatives. McDonald’s served Garden McNuggets made of beans, Irish fast food chain R. Haecker’s offers a veggie nugget meal made with beans and cabbage, and Swedish fast food restaurant Max Hamburgare offers a dish containing nuggets made of falafel. Raw chicken maintains its quality longer in the freezer as compared to when having been cooked because moisture is lost during cooking. There is little change in nutrient value of chicken during freezer storage. For optimal quality, however, a maximal storage time in the freezer of 12 months is recommended for uncooked whole chicken, 9 months for uncooked chicken parts, 3 to 4 months for uncooked chicken giblets, and 4 months for cooked chicken. Freezing doesn’t usually cause color changes in poultry, but the bones and the meat near them can become dark. This bone darkening results when pigment seeps through the porous bones of young poultry into the surrounding tissues when the poultry meat is frozen and thawed. It is safe to freeze chicken directly in its original packaging, however this type of wrap is permeable to air and quality may diminish over time. Therefore, for prolonged storage, it is recommended to overwrap these packages. It is recommended to freeze unopened vacuum packages as is. If a package has accidentally been torn or has opened while food is in the freezer, the food is still safe to use, but it is still recommended to overwrap or rewrap it. 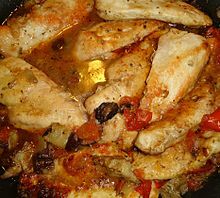 Chicken should be away from other foods, so if they begin to thaw, their juices won’t drip onto other foods. If previously frozen chicken is purchased at a retail store, it can be refrozen if it has been handled properly. Chicken can be cooked or reheated from the frozen state, but it will take approximately one and a half times as long to cook, and any wrapping or absorbent paper should be discarded. Giblets /ˈdʒɪblɨts/ is a culinary term for the edible offal of a fowl, typically including the heart, gizzard, liver, and other visceral organs. A whole bird from a butcher is often packaged with the giblets (sometimes sealed in a bag in the body cavity). The neck is often included with the giblets, as, in the West, it is usually separated from the body during butchering. Much poultry, especially that sold in supermarkets, is quartered and consequently the giblets are not included. Giblets can be bought separately from a butcher, but the demand for human consumption is low in most Western countries, so they are more often sold to pet food manufacturers. 1. In a 2 quart saucepan, simmer the giblets, salt, pepper, bouillon, celery and onion in 1 quart of water for 40 to 50 minutes. 2. Discard celery, onion and gizzard. Chop liver and neck meat and return to pan. Add chicken broth or if you have a turkey, use drippings (about 1 1/2 cups and 1 can of chicken broth). 3. Chop eggs and add to broth. Mix cornstarch and milk together and slowly add to broth. Stir well until thickened. Reduce heat to low. This week is about Chicken Feet. I have to admit I’ve never tried them, and can’t say I ever will. But they are popular around the World so It’s all about the Chicken (Feet). Chicken feet are a part of the chicken that is eaten in China, Indonesia, Korea, Malaysia, Trinidad and Tobago, Jamaica, South Africa, Peru, Mexico, Philippines, Middle East and Vietnam. Most of the edible tissue on the feet consists of skin and tendons, with no muscle. This gives the feet a distinct texture different from the rest of the chicken’s meat. Its many small bones make it difficult to eat for some; these are often picked before serving. Being mostly skin, chicken feet are very gelatinous. Chicken feet are utilized in several regional Chinese cuisines; they can be served as a beer snack, cold dish, soup or main dish. In mainland China, popular snack bars specializing in marinated food such as yabozi (duck’s necks), marinated chicken feet), which are simmered with soy sauce, Sichuanese peppercorn, clove, garlic, star anise, cinnamon and chili flakes. Today, packaged chicken feet are sold in most grocery stores and supermarkets in China as a snack, often seasoned with rice vinegar and chili. Another popular recipe is bai yun feng zhao, which is marinated in a sauce of rice vinegar, rice wine flavored with sugar, salt, and minced ginger for an extended period of time and served as a cold dish. In southern China, they also cook chicken feet with raw peanuts to make a thin soup. The huge demand in China raises the price of chicken feet, which are often used as fodder in other countries. As of June 2011, 1 kg of raw chicken feet costs around 12 to 16 yuan in China, compared to 11–12 yuan for 1 kg of frozen chicken breast. 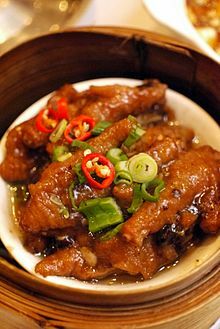 In 2000, Hong Kong, once the largest entrepôt for shipping chicken feet from over 30 countries, traded a total of 420,000 tons of chicken feet at the value of US$230 million.Two years after China joined the WTO in 2001, China has approved the direct import of American chicken feet, and since then, China has been the major destination of chicken feet from around the globe. Aside from chicken feet, duck feet are also popular.Duck feet with mustard, which is often served with vinegar, fresh green pepper and crushed garlic, is a popular salad/appetizer. Chicken feet are basted in a hot red pepper sauce and then grilled. They are often eaten as a second course and served with alcohol. Chicken feet are known as ceker in Malaysia and are traditionally popular mostly among Malays of Javanese, Chinese and Siamese descent. 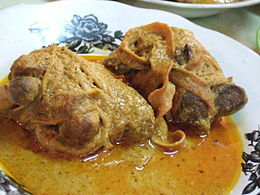 Many traditional Malay restaurants in the state of Johor offer chicken feet that are cooked together with Malay-style curry and eaten with roti canai. In the state of Selangor, chicken feet are either boiled in soup until the bones are soft with vegetables and spices or deep fried in palm oil. Chicken feet are also eaten by [Malaysian Chinese] in Malaysia in traditional Chinese cooking style. 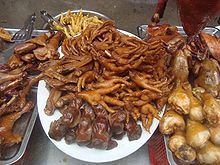 In South Africa, chicken feet are mainly eaten in townships in all nine provinces, where they are known as “walkie talkies” (together with the head, intestine, hearts and giblets) and “chicken dust”, respectively. The feet are submerged in hot water, so the outer layer of the skin can be removed by peeling it off, and then covered in seasonings and grilled. The name “chicken dust” derives from the dust chickens create when scratching the ground with their feet. In the Philippines, chicken feet are marinated in a mixture of calamansi, spices and brown sugar before being grilled. A popular staple in Philippine street food, chicken feet are commonly known as “adidas” (named after the athletic shoe brand Adidas).